G eologists are strange people. Not that I have anything against them – some of my worst friends are geologists. Take for example the small matter of the Naukluft Mountains. They want us to believe that some 500 million years ago this mountain massif moved from the Gamsberg area, about 80 km away, to its present position. Enough! We will not go into a detailed explanation of how they claim this happened. If you’re interested, there are two books on the main geological features of the country in most bookshops. Wherever these mountains came from, they are the most underrated in the country. They’ve been there all this time and yet many Namibians and visitors have never been there, or, even more surprising, know very little about them. Perhaps we should say no more and leave people in ignorance, keeping the secret to ourselves. What makes the Naukluft Mountains especially interesting and different is the fact that they are water-rich. The dolomite formations store large quantities of water in underground caverns, and as this water is slowly released, fountains are fed in many of the gorges. As water is life, animals, birds and plants flourish at these places. The explorer, hunter and trader, James E Alexander, was the first European to describe the area in his book, Expedition of discovery into the interior of Africa, published in 1838. His route took him from Büllsport along the Tsondab River to Ababis. Today it is a half-hour journey along the gravel road, but with his ox wagons and their steel-bound wheels, the trek along this unknown rocky valley must have been rather difficult. Of course, his hunting of rhino and other animals made it an interesting and exciting trip. He also had an encounter with a buffalo. While there are no rhino and buffalo left today, visitors will see many kudu, klipspringer and Hartmann’s mountain zebra in the valleys and mountains of this area. The largest section of the Naukluft Mountains lies within the borders of the Namib-Naukluft Park. The park is an amalgamation of the Namib Desert Park, proclaimed a game reserve by the German colonial government in 1907; the Naukluft Mountain Zebra Park created in the late sixties when the SWA Administration bought the farm Naukluft and several other farms situated in the mountains; and state land to the west, to form the Namib-Naukluft Park, which was proclaimed in 1978. A large portion of the Diamond Area was added subsequently to form the largest conservation area in Southern Africa (50 000 km2). To appreciate the Naukluft Mountains, you need to walk into them and not just look at them from a distance. There are many trails to hike, their duration ranging from three hours to eight days. From the camping site at Naukluft in the park, you can tackle the Waterkloof or Olive Trail, eight and five hours respectively. Alternatively, wander slowly along the Naukluft River, next to pools of crystal-clear water tumbling over moss-covered rocks. The campsite is situated in a grove of shady false-ebony and sweet-thorn trees. You can also visit Naukluft as a day visitor. One of the farms not sold to the conservation authorities almost forty years ago was Büllsport. The Köcherbaumschlucht (quiver-tree gorge) on this farm is one of the most impressive gorges in the mountain massif. 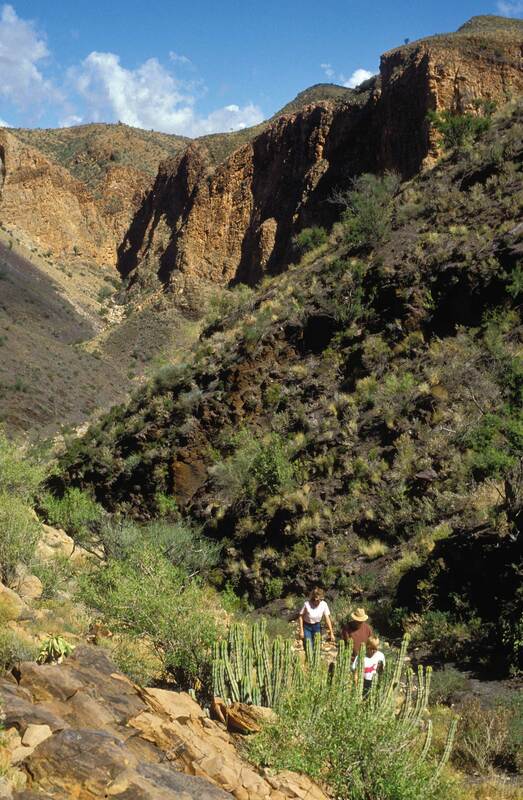 A walk up this gorge between towering rock walls is spectacular. Or you can drive to the top of the plateau and then walk down past the pools to a pick-up point. Alternatively, visit the impressive Rock Arch. A good place to pitch your tent is at the new campsite near the Tsondab River with its remarkable view of the river valley. In a gorge housing the remains of a police station erected during the German era more than a hundred years ago, is another campsite. 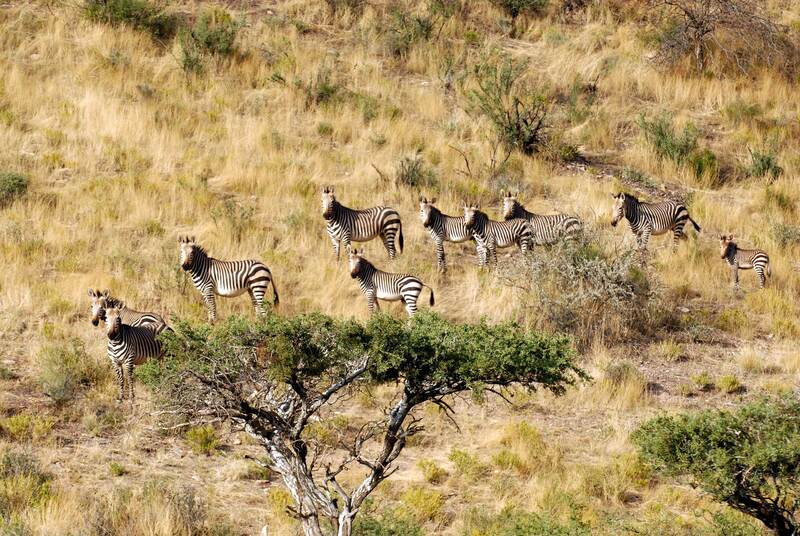 When we inspected the sites, the kudu were so tame we almost had to chase them off. They and the Crimson-breasted and White-tailed Shrikes, waxbills, Monteiro’s Hornbill and other bird species had us pointing our cameras at them and clicking away madly. 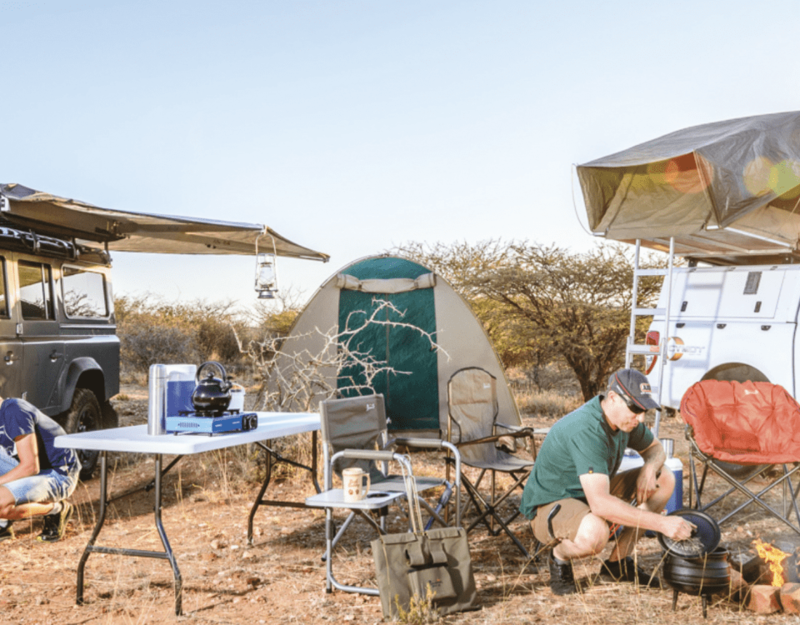 Reservations for camping at Naukluft can be made with Namibia Wildlife Resorts at Central Reservations Office +264 61 285 7200 or phone Naukluft Campsite at Tel +264 63 683 791/ +264 811 443 478. Büllsport Guest Farm and Camping can be contacted at Tel 063 69 3371. This article was first published in the Oct/Nov 2007 issue of Travel News Namibia.